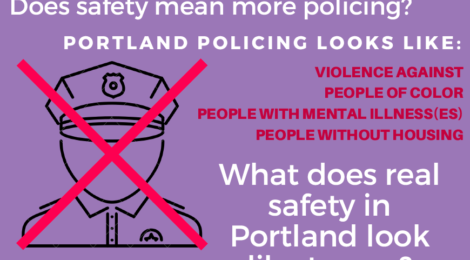 On Tuesday April 3rd and Tuesday April 17th, members of Care Not Cops are mobilizing to an open community budget hearing to demand that the City Council reject the Portland Police Bureau’s request to increase their budget. We are demanding that mental health care be in the hands of community, and are calling for a reduction in police spending towards ultimately disarming and defunding the police. We unequivocally reject the Portland Police request for a budget increase of $12.7 million in order to hire for 93 new police positions! Read our budget analysis here. Care Not Cops will be mobilizing to two budget forums. Please join us at both and come through to our rally on April 17th at 5pm where we will hearing from community speakers on our demands. Show up starting at 5pm to sign up for public comment – opportunities will fill up quickly! We will provide talking points and preparation for public comment. As a Portland resident, I reject the requested increase in funding to the Portland Police Bureau and support investments in robust, community-determined care and crisis response. City of Portland Mayor and Council Members’ must demonstrate their commitment to the safety of Portland communities, especially communities of color and those needing mental health care who are targeted by police violence, by implementing an immediate reduction in the Police budget. The Council must implement an immediate freeze on new PPB hires, instead of the nearly 100 new positions proposed. No amount of training can make police the correct responders to mental health crises, because interaction with police re-traumatizes, incarcerates, and harms. I support Portland redirecting policing funds toward communities. The Council must actively invest in life sustaining resources and services such as funding for housing, mental health crisis outreach workers, and ongoing longterm support for people with mental health needs. I urge Portland elected officials to show that your priorities really lie with serving the needs of the most targeted and vulnerable communities by directing funding away from policing.